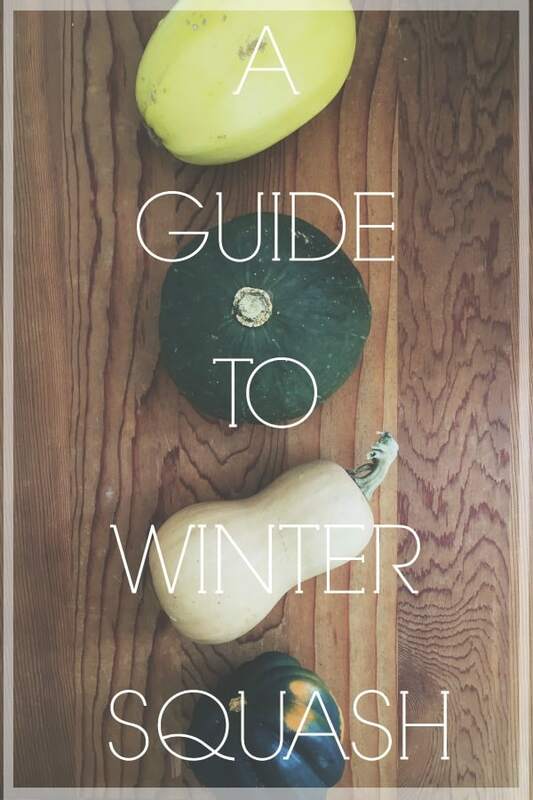 Learn all about spaghetti, butternut, kabocha (also known as buttercup) and acorn squash in this guide to winter squash. Don’t be fooled by the name, winter squash is not just for winter. In fact, it’s in season right now! And considering it weirdly snow flurried yesterday (yes, on October 18th) here in NY, winter is letting us know it’s just around the corner. There is a plethora of winter squash out there but we’re going to focus on the main 4: butternut, acorn, spaghetti and kabocha (also known as buttercup) today because that’s what seems to be easiest to find at my local farmer’s market and this post is part of my seasonal/local eating series sponsored by partner, Silk. It’s kind of crazy to think this series started with spring peas in this sweet pea lemon crepe cake and strawberries in this guide to strawberries and here we are almost half a year later talking about squash. Winter squash despite it’s name, is actually in season from the late summer through fall. It’s thick skin/rind, unlike summer squashes like zucchini, help it keep for long periods of time, through winter. Picking it: There’s not much to picking a good winter squash. There shouldn’t be any soft spots and it should feel nice and heavy. Storing it: Sort of like potatoes, winter squash stay best in a cool, dark place. I’ve actually stuck mine in our unfinished basement before and they’ve stayed all winter (4-5 months) down there without issue. If you keep them on your counter-top, you’ll want to use the squash within about 2-3 months. Health benefits: There are so many! Winter squash are all a low-calorie, healthy complex carbohydrate full of fiber and an excellent source of vitamin A, C and potassium. Iron and beta carotene also rank high in winter squash, the darker the skin, usually the higher the source of beta carotene. Sub out winter squash for pasta, breads, rice and other grains once and awhile for healthy boost! spaghetti squash | this squash can be baked, steamed, boiled and even microwaved. Yep, I’ve cooked one entirely in the microwave before, so easy! My favorite way though is roasted. Simply slice the squash in half, lengthwise, scoop out the seeds and place in a baking dish. Roast at 375-400 degrees until flesh is soft and can easily be scraped, at least 45 minutes. Once it’s cooked, scrape the flesh out with a fork and it turns into spaghetti like strands. Use it as a healthy pasta replacement like as the base for this spicy porter short rib chili, stuff it like in this chocolate chili stuffed spaghetti squash or make fritters out of it like these spicy spaghetti squash latkes. You can even make this crazy “pasta-like” comfort dish of turkey sausage spaghetti squash baked ziti! kabocha squash | this is an Asian variety of winter squash. Most kabocha on the market are kuri kabocha, also called buttercup squash. Kabocha are dark green, squat and sometimes called Japanese pumpkins. The kabocha flesh has a very distinct, strong flavor. It’s sweet (even sweeter than butternut) and almost reminiscent of the inside of a chestnut. While the rind is edible, most will peel it off or discard after roasting. My favorite way to eat kabocha is to roast slices of it (with the rind attached) on a sheet pan seasoned with cinnamon and other sweet spices. Once roasted, scoop the flesh right off the rind. It also makes a delicious puree given it’s natural sweetness. You can also stuff kabocha like in this wild mushroom couscous lamb stuffed kabocha squash or make soup with it in this cinnamon ginger kabocha squash soup. butternut squash | the skin of a butternut squash is very thin unlike most other winter squash varieties. I usually remove it with a vegetable peeler before cooking. Butternut is commonly known for its sweeter flesh, but compared to the kabocha, it’s definitely not as sweet and more like a traditional pumpkin flesh. Butternut squash has become pretty interchangeable with sweet potatoes and is a great lower-calorie option roasted, pureed or mashed. It’s a squash that lends itself well to either savory or sweet preparation. Make a sauce with it and prepare this creamy sage butternut white bean gnocchi, roast it and use it in this barley butternut squash salad, serve it as a puree instead of potatoes in this creamy coconut garlic butternut squash puree or make a fun lasagna inspired dinner everyone will love with these butternut squash lasagna roll-ups with chicken and spinach. acorn squash | with its distinct ridges that make it look just like an acorn, you can’t confuse this winter squash with any others. Acorn squash can be used in soups and purees but the flavor profile tends to be best when baked or roasted. It’s often times stuffed, like in this apple lentil stuffed acorn squash but can also be made into onion ring like form for a fun way to get your squash on like in these coconut crusted acorn squash rings. I am literally OBSESSED with Kabocha squash. I eat 2-3 a week (some if actually in my oven right now!) 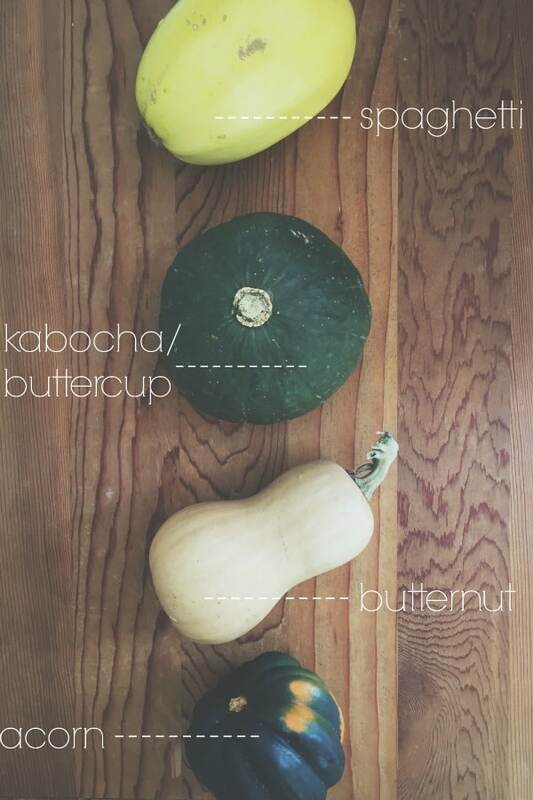 This is such a great guide for those just getting into winter squash – pinned! I love your guides. Winter squash is often on the menu and those lasagna roll ups are on my list to try! I’ve STILL never tried kabocha, but I’m pretty sure we have some coming in our winter CSA, so I’ll finally be able to remedy that! Such useful information! I’ve never cooked a kabocha squash before, can you believe that? I need to! Such a great post for people who need squash help, seriously awesome idea! I always see people by the squash staring at it like it’s an alien. Great guide lady! Winter squash is the best. Kabocha is still my favorite — I love the texture and that fact that you can eat the skin. I’ve tried a few Buttercup squash before and they were similar to Kabocha but not 100% the same so I always try to make sure it’s actually labelled Kabocha before buying. I have never had luck with the Kabocha squash. How to tell if it is ripe? How to slice without injury???? I’m obsessed with carnival squash. It’s like acorn but it’s sweeter, no sugar required. I roast it in foil ,quartered with a pinch of nutmeg and some butter. One downfall is that it’s hard to find.